Adam Quinn in action for Halifax during the 2006 Conference play-off final. 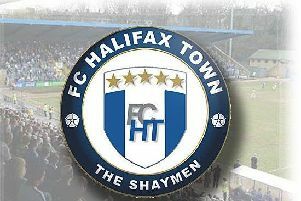 FC Halifax Town could move into the National League North play-off places with a win at Gainsborough Trinity on Tuesday (7.45pm). Town will need other results to go their way to move up into the top five, but could be nine points off top spot if they lose and Fylde win at Stockport. Halifax have taken seven points from their last three games but were unconvincing in Saturday’s 1-0 victory over Stalybridge. Josh Macdonald came off with a hamstring strain in that game and was due to be assessed before Tuesday’s match, while Matty Kosylo might return from his knee injury, which has kept him out of two of Town’s last three matches. There will be at least one change to the Halifax team though, with centre-back Danny Hone suspended following his red card at Salford, with Keil O’Brien or Nathan Hotte the most likely candidates to replace him. Gainsborough beat Telford 3-1 on Saturday, with two goals from top-scorer Ashley Worsfold. He is a former Harrogate Town striker who scored 16 goals for the North Yorkshire club in the 2013-14 season and joined Gainsborough from Buxton in the summer. Former Halifax players Jonathan Hedge and Adam Quinn are in the squad at Gainsborough. Hedge had two spells at Halifax, with the second seeing him win back-to-back promotions in two seasons under Neil Aspin. Quinn was part of the Halifax team that reached the 2006 Conference play-off final but left Town when they went bust in 2008. Gainsborough striker Nathan Jarman won the FA Trophy while at North Ferriby under Billy Heath. Player-manager Dom Roma took temporary charge during last season and was given the job permanently after guiding them to 16th place. But they have won just two of their first 10 games this term, keeping only one clean sheet.